Photos Of Damaged Coins – These Are The Kinds Of Coins To Avoid Collecting! You’re probably asking yourself what damaged coins look like, though. Does wear, by itself, cause damaged coins? Let’s talk a bit about damaged coins, look at a picture of a problem-free coin, and also look at photos of damaged coins. These aren’t all of the different types of damage found on coins — but they’re among the most common. The 1909-VDB Lincoln cent seen here is the type of coin that most coin collectors want – a coin with no damage whatsoever! This photo shows a coin that, yes, is worn, but is otherwise what coin collectors call problem free. It hasn’t been cleaned, isn’t bent, isn’t corroded, and otherwise just shows normal wear and tear for its age and grade. This is the type of coin you should seek for your coin collection. Whenever a value or price is given for most coins, a problem-free coin is the assumption. When shopping for scarce or old coins, finding a problem-free coin can be rather difficult. However, it’s worth the wait (and the money) to buy a problem-free example anytime you want to buy a nice coin. Problem-free coins are more likely to increase in value than damaged coins, and problem-free coins always have a market. Here are the photo examples of a few different types of damaged coins. Some of these photos are truly ugly, but – unfortunately – many coins are damaged. It’s true that some people buy damaged coins because they cost less than problem-free coins. These damaged coins (often called cull coins) do represent deeply discounted buying opportunities for coin collectors wanting to buy some otherwise expensive coins on the cheap. But damaged coins are generally not good investments and are often very hard to sell. So, let’s take a look and see the type of coins most of us want to avoid having in our coin collections. If any of your coins look like the ones below, then most of the coin values you’ll come across online or in books will generally not apply to your damaged coins. Cleaned coins probably represent the most common type of coin damage encountered. Cleaned coins can sometimes be hard to spot — because they are either in the process of naturally retoning, or because the person who cleaned them did what some might say is an expert job. Most cleaned coins, however, will have a very obvious and unnatural color and brightness. The coins in this photo include a cleaned 1937 Lincoln cent in the process of retoning, a freshly cleaned 1975-D Lincoln cent, and a 1986 Lincoln cent heavily rubbed with a pencil eraser. Cleaned coins aren’t preferred by any coin collectors. And always remember — you should always avoid cleaning coins, no matter how tempting it may be! Coins are often used as jewelry. In many cases, coins used in jewelry are holed so they can be placed on a string, beads, or necklace. Coins with holes are worth only a fraction of their problem-free value. NOTE: There are many foreign coins which have intentional holes created by the mints at which those coins are made. These are worth their normal value. The 1961 Lincoln cent in this picture has a very distracting, obvious hole right in front of Lincoln’s chin. Bent coins are another common type of coin damage. Coins can get bent in a number of intentional and accidental ways. However a coin became bent, its value is reduced significantly from what it would have been worth without being bent. 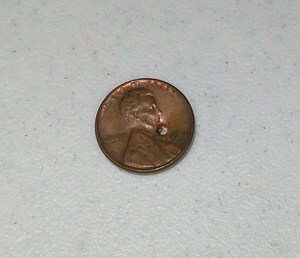 You can see a slight but nevertheless completely unattractive bend in this 2000-dated Lincoln penny. The bend is most evident on the left side of the coin, where it reads LIBERTY. 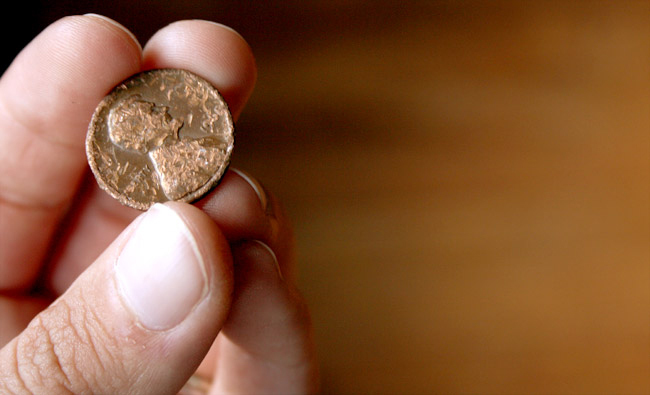 Corrosion is a very common problem with copper coins. In addition, areas that have a lot of fumes are also unsuitable for copper to remain unharmed. Coin corrosion can be avoided if coins are kept away from any type of dampness, chemicals, fumes, and temperature extremes. Also, be sure to house your copper coins in sulfur-free, polyvinyl chloride (PVC) free coin albums and coin holders. Generally speaking, copper coins should not be kept in any holders made of paper or standard cardboard. The green Lincoln Memorial cent above is so corroded that the date can’t even be read! The brown-colored 1941 Lincoln cent just to the right isn’t quite as bad off as that green, bubbly Lincoln cent above. But, unfortunately, this 1941 penny is still quite porous as can be seen in the countless pits and blackened areas all across the surface. Here’s the difference between Post-Mint Damage (or Post-Strike Damage) and Error Coins.